Riding on the success of 2014’s first high school hackathon, YouthHack Manila upped its game this year with Code Weekend, thirty-six hours of pure coding. The overnight event, held at Microsoft Philippines last July 11 and 12, drew close to one hundred students from various high schools and universities in the metro for workshops on coding, entrepreneurship, and the future of the technology industry in the country. Unique among hackathons of its calibre, Code Weekend did not require its participants to already be familiar with coding languages. Seasoned coding veterans and aspiring programmers alike ended weekend run with an application of their own. The first day kicked off with a session on the basics of web development by Mr. Mark Tarcelo, a computer science teacher at Philippine Science High School. Tarcelo introduced concepts and real-world examples in using HTML, CSS, and Bootstrap. “If you want to understand how these new technologies are going to impact or maximize your life, you need to understand how these work, and how you can make your own contribution,” Tarcelo adds. This was followed by a workshop on PHP, Apache, and MySQL by members of the University of the Philippines Center for Student Innovations (UP CSI). The session explored website dynamicity and interaction. The intersection of technology and entrepreneurship became the theme of the second day, with Mr. Paul Gadi of Altitude Games and Mr. JC Soriano of MagisSolutions giving talks on the shifts in the business world. Participants scrambled to finish their programs in order to pitch them to a panel of judges, including Gadi, and Mr. Lyle Jover of Raket.ph, a network of freelancers turning to the digital world to make money. Six teams made it to the final round of pitching, with applications ranging from “classified ads for mentors and mentees” to a website that matches prospective pet owners with underprivileged pets. However, three programs proved to be a cut above the rest. Where’s the Loo?, in third place, is a web and mobile app that allows users to find and rate toilets in public places. Users can add toilets they find on the map and gain points when they rate and supply relevant information. The team was composed of students Kimberly Gamboa, Arvy Ngo, Jeremy Uy, and Alexis Ngo from Philippine Science High School. The silver prize went to Mentor Town, a project that seeks to connect people who want to learn skills with mentors who can teach them. The appeal of Mentor Town lies in the strength of its mentor-mentee community. The innovators behind Mentor Town are Alexis Collado, Royce Chan, George Balmaceda, Vince Agbayani from Ateneo de Manila University. Team Moller-Trumbore, composed of Willard Torres from Ateneo de Manila University and Miguel Madridejos from University of the Philippines Diliman, took home the crown. Torres and Madridejos were the only ones among the top six teams to have created a game. The game involves colored blocks in empty space — and the only limit is the user’s imagination. Blocks can be used to fill out the space, and movement is simple, with the standard WASD and arrow keys. Users can create a solo project or participate in joint play. The top three teams were awarded Microsoft gift bags and scholarships for higher learning from Gates Professional Schools. 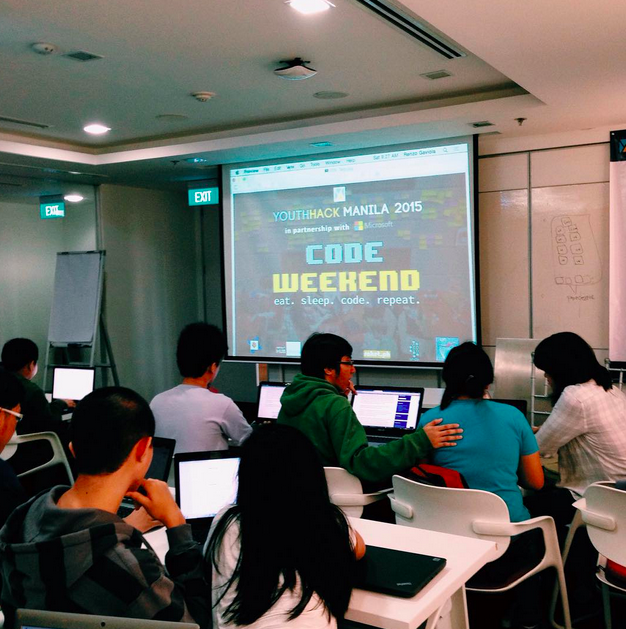 YouthHack Manila, the mother organization of Code Weekend 2015, is a youth-led initiative that enables budding innovators to use technology and entrepreneurship to change the world. Learn more about YouthHack Manila by visiting our website www.youthhack.net and liking our Facebook Page www.facebook.com/YouthHackMNL. If you’re interested in partnering with us for future events, feel free to email manila2015@youthhack.net.